Songkran, the Thai New Year, is celebrated every year on April 13. Festivals and celebrations in the U.S. occur within a week of that day. In April, Thai Town in Los Angeles, California hosts a giant street fair, closing Hollywood Boulevard for six blocks. The Wat Thai Buddhist Temple in North Hollywood, the largest Thai Buddhist Temple in Los Angeles, serves as the cultural center for the southern Californian Thai community and hosts a festival in honor of Songkran. Usually, these celebrations are held the first two weekends in April. Both events have lots of Thai food and elaborately costumed dancers of all ages and offerings to the Thai Buddhist monks as well as other New Year customs. Songkran comes from the Sanskrit word Sankranti, which means "astrological passage" or "transformation." It coincides with the arrival of spring, and the rising of Aries on the astrological chart. Songkran is a celebration that embraces goodwill, love, compassion, and thankfulness. Songkran is celebrated in Thailand, Laos, Cambodia, Myanmar, Sri Lanka, parts of northeast India, parts of Vietnam, and Xishuangbanna, China. The holiday coincides with the equivalent Hindu calendar-based New Year festivals in most parts of South Asia which are collectively referred to as ​Mesha Sankranti, which literally means "sheep transformation," referencing the transformation into the Aries constellation. Aries' zodiac sign is represented by a ram. In Thailand, Songkran celebrations are held in almost every part of the country. 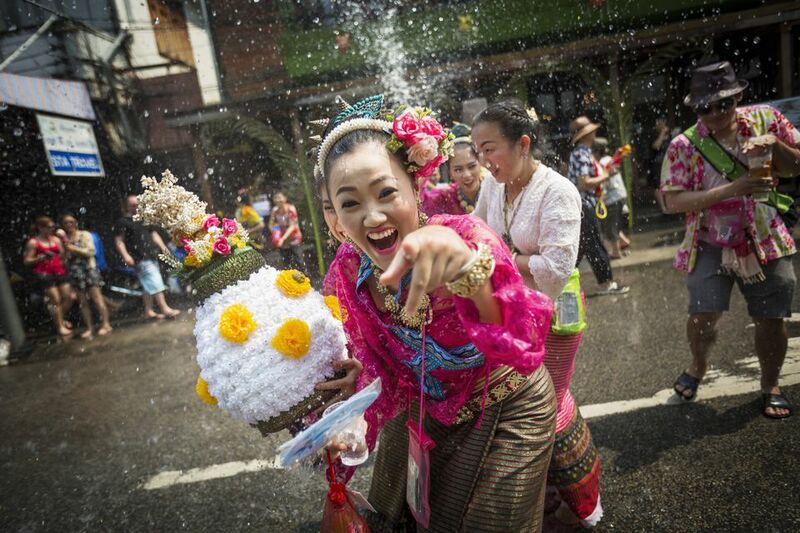 The Songkran celebration is rich with symbolic traditions. Songkran is a time to reunite with loved ones and elders and to pay homage to ancestors. Mornings begin with merit-making. If you are Jewish, you may be familiar with the concept as it's like performing a mitzvah, or good deed. On the first day of Songkran, which is usually a three-day celebration, Thais perform the Rod Nam Dum Hua ritual, which is officially National Elderly Day. During the ritual, the younger people pour fragrant water into the elders’ palms as a gesture of humility and to ask for their blessings. The second day of Songkran is officially the National Family Day. Families usually wake up early and give alms to the monks, then the rest of the day is spent together having fun as a family. Songkran usually includes a visit to a local temple, and offerings of food to Buddhist monks. As it is a new year, monks pour water on Buddha statues, the young, and elderly, as a way to purify and symbolize renewal. Also, the holiday is known for its water festival which is mostly celebrated by young people. Major streets are closed to traffic and are used as arenas for water fights. Celebrants, young and old, participate in this tradition by splashing water on each other. Traditional parades are held as well as beauty pageants where contestants are clothed in traditional Thai dress. The Songkran Street Fair in Thai Town, Los Angeles is one of most notable celebrations. The free, day-long event takes place along six big city blocks on Hollywood Boulevard between Western Ave and Normandie Ave. This is one of the largest festivals in the Los Angeles area. The area is home to many of the 80,000 Thais estimated to be living in southern California. The street fair and parade attracts more than 250,000 people each year and involves a daily prayer, dance performances, beauty pageant, fashion show, culinary show presented by world-renowned Thai chefs, Muay Thai martial arts competition, live music, the Singha beer garden, Thai traditional ceremonies, an ice sculpture carving show, lei making, food stalls, and more. Thai food is the star including stalls from local participating Thai Town restaurants. Favorite Thai dishes are included, like Thai curry, khao soi, pad thai, tom kha, som tum, Thai BBQ, mango-sweet rice, fresh Thai coconut, and more. One lucky woman age 16 to 25 is selected each year as Miss Thai New Year. Contestants must have at least one Thai parent. The Wat Thai Buddhist Temple in North Hollywood hosts a two-day celebration in honor of the Thai New Year. Celebrate the day with a water blessing at the Buddha statue by the monks, prayer, chanting, building sand pagodas and castles, classical Thai music and dance, Thai food, Thai arts and crafts, the ​Songkran Festival Queen beauty pageant contest, games, and more.